Who’s that bringing a big old arty party and a right old racket to Lightwater Valley this month? It’s only Mister Maker and TV adventurer Andy Day! Yes, two children’s entertaining legends are headed to the theme park this month and they’re bringing oodles of fun for the summer holidays with them. Kicking off the month of merry madness is Andy Day, who’ll be showing up the likes of Jay-Z and Kanye West with his Prehistoric Raps on 12th-13th August! The TV adventurer likes nothing more than to make a song and dance about dinosaurs, and he’s inviting you to get involved. The half hour show encourages you to don your woolly mammoth trunks and roar like never before. It’ll make even your mum and dad want to travel back in time to witness it all over again! Don’t go too far back in time though as you’ll want your little creatives to be back in time to help Mister Maker and craft something of their own (even big kids can get involved too!) on 26th-27th August. The ultimate crafts hero is winging his way to outside Ripon to help his band of mini-makers dancer, sing and get stuck in to some arty activities. Mister Maker is sure to weave a little bit of arty magic into your life. And of course there’s the whole park to enjoy afterwards! Whether it’s something for those looking to take it easy or you’re after an adrenaline-pumping time on The Ultimate, there’s a ride for everyone to enjoy after meeting with Andy and Mister Maker! 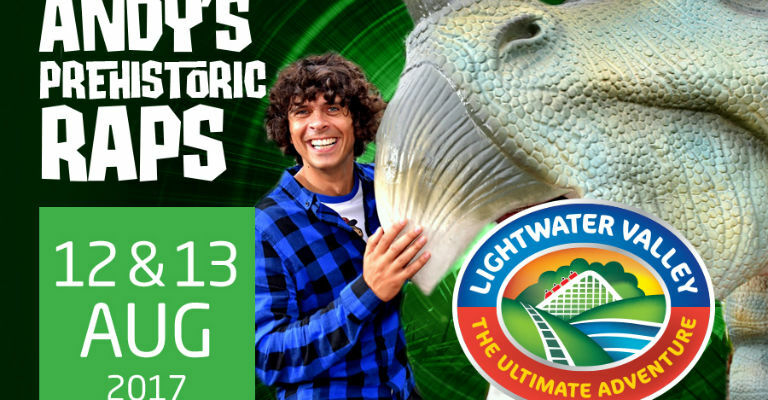 For more information about events at Lightwater Valley, visit their official website.